The Army and Navy Club (ANC) Library, founded in 1891, is one of the oldest private libraries in Washington, DC. The private Army and Navy Club is on Farragut Square, just blocks from the White House. Like most social clubs, the ANC has overnight rooms, dining facilities, bars and meeting spaces. 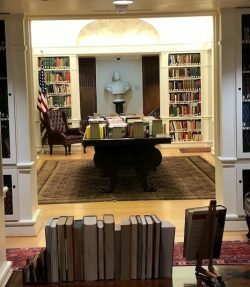 The ANC library is staffed by a full-time librarian and provides an important source of information with its wide range of books, scores of periodicals, and a fine private military collection. It is one of the largest private libraries in D.C. It houses mostly military subjects, including hundreds written by club members. The library has an endowment program with any gifts or donations being fully tax deductible. The ANC library is valued by members for its unique and handsome atmosphere and is a sanctuary for casual or scholarly reading.